Istria, with its strong Italian influence is a popular destination for visitors to Croatia - and it’s not hard to see why! The Istrian peninsula enjoys a pristine coastline with tiny fishing villages dotted along the clear azure of the Adriatic Sea, and a hinterland rich with vineyards and pine forests. Further inland pretty hilltop towns offer historical charm and outstanding cuisine, evoking the flavours of Italy. The Istrian coast is the ideal destination for families looking for a break in the sun as well as those who love to explore. Our campsites are perfectly placed to enjoy everything this beautiful region has to offer. Labin Set on the Eastern coast of the Istrian peninsula, Labin has been inhabited for at least two thousand years. Famous for rebelling against Italian occupation in 1921 – and declaring itself a republic – the town retains many fine buildings from its Venetian past. The museum features a miniature coal mine, a relic of Labin’s industrial heritage. Groznjan This medieval hilltop town overlooking the Mirna valley lives and breathes art and music. Art galleries, studios and exhibitions are all around: music is in the air as you wander the twisting streets and there are recitals and concerts throughout the summer months. 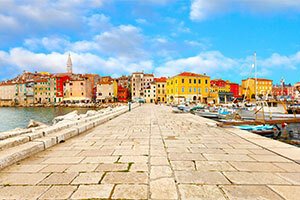 Rovinj With its lively cafés, charming harbour and colourful houses Rovinj feels and looks Italian, so it’s no surprise to discover that this picturesque fishing port was once part of the Venetian republic. Its narrow cobbled streets, tiny squares and quaint chimneys, are all overlooked by the church, with a copper statue of St. Euphemia acting as a weathervane. Climb the tower for stunning views over the town and the Rovinj archipelago. Brioni Islands Legend has it that these 14 islands are pieces of the Garden of Eden, placed here by angels. The largest island can be reached by ferry: visit the Tito Museum and the Safari Park –founded with animals gifted to him by international leaders. Porec Porec old town is traffic-free and restaurants are reasonably priced. Don’t miss the spectacular painted ceilings and mosaics in the Euphrasius Basilica. A little out of town is the superb Baredine cave, where the limestone features are said to resemble sculptures of buildings and people. Trieste Hop over the Italian border to Trieste (passing thorugh Slovenia as you go) to visit the amazing interactive science centre, and the stunning Castello di Miramare, once the home of Archduke Ferdinand Maximilian, Emperor of Mexico. To find your perfect campsite in Istria please use our interactive site finder, call our knowledgeable customer advice team on 01 242 1901, or go straight to the individual campsite pages.